It appears that Antonio Brown's time in Pittsburgh is coming to an end. 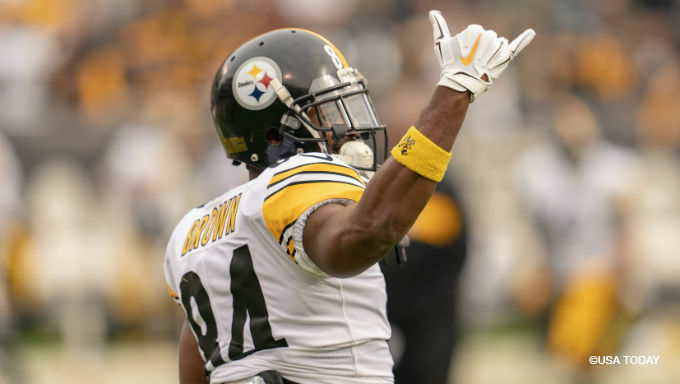 The All-Pro receiver has seemingly forced his way out of town and is on the trade market, and during the team’s offseason press conference, general manager Kevin Colbert confirmed the team will look to trade him this offseason. Where he lands will impact NFL betting odds, in some cases significantly, so savvy bettors need to be ready to pounce. At this point of the offseason, the 49ers have to be considered the favorites to land Brown, arguably the best receiver in the NFL on the market. San Francisco is the team that Brown wants to be traded to, and the 49ers need a No. 1 receiver. Considering that the 49ers are in the NFC and on the other side of the country, it wouldn't be a bad place to ship Brown off to from the Steelers' perspective. As for the fit, Brown would likely put up monster numbers in Kyle Shanahan's offense. Throughout his career, we have seen Shanahan get the most out of elite talents, such as Josh Gordon and Julio Jones. Brown would be fed in San Francisco, and with George Kittle, Marquise Goodwin and Dante Pettis on the roster, they would instantly become one of the most explosive offenses in the NFC. If Brown ends up in San Francisco, expect the 49ers win total to rise by a game or even two. As of now, the 49ers are +3300 in Super Bowl betting futures. I would expect them to jump up quite a bit with a move of this significance. Last season, the Oakland Raiders and Pittsburgh Steelers executed a trade for a talented, yet troubled receiver in Martavis Bryant. While that move didn’t ultimately pan out for the Raiders, I don’t expect it would scare them off from taking another chance. With the Raiders having a significant need at receiver and a war-chest of draft picks over the next two seasons, nobody in the league may be in a better position to take a chance on Brown’s talent than the Raiders. If Brown were to land in Oakland, this might be the worst-case for his value. Quarterback Derek Carr has proven to be hesitant throwing the ball down the field, even when he has elite talent on the outside, such as Amari Cooper. Even if the Raiders were to acquire Brown, I wouldn’t expect their win total or Super Bowl odds to change much, if at all. However, it would signal that the Raiders are ready to start competing, rather than continuing to tank. One team that isn't afraid to swing for the fences via trades is the Los Angeles Rams. Over the last two seasons, we have seen Sean McVay trade for Sammy Watkins, Brandin Cooks, Marcus Peters, Aqib Talib, among others. The Rams are in the business of acquiring as much talent as possible, and if they can get a player like Antonio Brown at a discounted price, they will be interested. Los Angeles is already loaded at receiver with Brandin Cooks, Robert Woods and Cooper Kupp, but none of those are even near the caliber of Brown. The Rams currently have the same odds to win the Super Bowl next season as the Saints at +900 with Karamba, but acquiring a potential Hall of Fame receiver such as Brown would likely be enough to increase their odds. Ideally, the Steelers would like to trade Brown out of the conference and to a non-contender. However, their best trade offers may come from within the AFC and possibly from an arch-rival. The New England Patriots are never afraid to take risks, especially at the receiver position. If Bill Belichick and Tom Brady acquired a talent like Brown, you best believe they will find a way to utilize him to his fullest ability. The Patriots' Super Bowl odds for the 2019 season sit at +750, tied for the best odds in the NFL. However, with a massive trade like this one or for the likes of Odell Beckham, the Patriots' odds would likely shoot-up to +600, if not higher. Despite New England likely being interested, don’t expect the Steelers to entertain any offers from their biggest rival. Another AFC team that could be interested in trading for the disgruntled, superstar receiver is the Indianapolis Colts. The Colts are a team with a ton of cap space available this offseason, and they need to add playmakers opposite of T.Y. Hilton. If the Colts were able to pull off a trade for Brown, they would finally have the firepower to keep up with the likes of the New England Patriots and the Kansas City. While the trade likely wouldn't be enough to push them ahead of those two teams, they would put them in a position to compete. With current Super Bowl odds of just +1400 with 888Sport, it wouldn't be a surprise to see that move up to +1200 or even +1000 if a trade does occur.